For the genus of grass skipper butterflies, see Pelopidas (skipper). Pelopidas (/pəˈlɒpɪdəs/; Greek: Πελοπίδας; died 364 BC) was an important Theban statesman and general in Greece. He was a member of a distinguished family, and possessed great wealth which he expended on his friends, while content to lead the life of an athlete. In 384 BC he served in a Theban contingent sent to the support of the Spartans in the Siege of Mantinea, where he was saved, when dangerously wounded, by the Arcadians. According to Plutarch's Life of Pelopidas (from Plutarch’s Parallel Lives in which Pelopidas‘s life was paired with the life of Marcellus), he ruined his inherited estate by showing constant care for the deserving poor of Thebes, taking pleasure in simple clothing, a sparse diet, and the constant hardships of military life. People said that he was ashamed to spend more on himself than the lowest of the Thebans spent on himself. Once, when friends argued that he needed to care for his finances since he had a wife and children, and that money was a necessary thing, Pelopidas pointed to a blind, crippled pauper named Nicodemus and said, "Yes, necessary for Nicodemus." Upon the seizure of the Theban citadel by the Spartans (383 or 382 BC), he fled to Athens and took the lead in a conspiracy to liberate Thebes. Spartans had kingship in their home and were supportive of oligarchic governments in other cities, and vice versa, cities with oligarchic and not democratic political system supported Sparta. 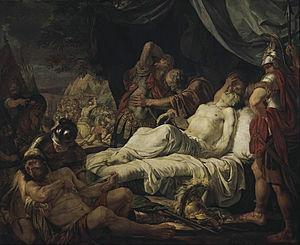 In 379 BC his party (the democratic) surprised and killed their chief political opponents in Thebes (members of the aristocratic party that supported the Spartans), and roused the people against the Spartan garrison, which surrendered to an army gathered by Pelopidas. In this and subsequent years he was elected boeotarch, and about 375 BC he routed a much larger Spartan force at the battle of Tegyra (near Orchomenus). This victory he owed mainly to the valour of the Sacred Band, an elite corps of 300 seasoned soldiers. At the battle of Leuctra (371 BC) he contributed greatly to the success of Epaminondas's new tactics by the rapidity with which he made the Sacred Band close with the Spartans. Epaminondas, an intuitive and genius general, used at Leuctra for the first time the oblique order, in which a local superiority of numbers can be used to defeat a superior force; then, by winning in detail, one can hope to win in the whole. After the battle at Leuctra Thebes became the strongest city of Greece and Sparta withdrew as a leading city. In 370 BC he accompanied his close friend Epaminondas as boeotarch into the Peloponnesus in order to humiliate Sparta even more. On their return, both generals were accused, unsuccessfully, of having retained their command beyond the legal term. In fact, the democrats and some aristocrats of Thebes acknowledged that Pelopidas and Epaminondas were the two most capable and important personalities of their city. Both were trying to establish a state that would unite Greece under the Theban hegemony. In 369 BC, in response to a petition of the Thessalians, Pelopidas was sent with an army against Alexander of Pherae. After driving Alexander out, he passed into Macedon and arbitrated between two claimants to the throne. In order to secure the influence of Thebes, he brought home hostages, including the king's brother, afterwards Philip II. Philip learned there many tactics of the southern Greeks, both in politics and in war. Next year Pelopidas was again called upon to interfere in Macedonia, but, being deserted by his mercenaries, was compelled to make an agreement with Ptolemy of Aloros. On his return through Thessaly he was seized by Alexander of Pherae, and two expeditions from Thebes were needed to secure his release. In 367 BC Pelopidas went on an embassy to the Persian king and induced him to prescribe a settlement of Greece according to the wishes of the Thebans. In 364 BC he received another appeal from the Thessalian towns against Alexander of Pherae. Though an eclipse of the sun prevented his bringing with him more than a handful of troops, he overthrew the tyrant's far superior force on the ridge of Cynoscephalae. However, wishing to slay Alexander with his own hand, he rushed forward too eagerly and was cut down by the tyrant’s guards. This article incorporates text from a publication now in the public domain: Chisholm, Hugh, ed. (1911). "Pelopidas" . Encyclopædia Britannica (11th ed.). Cambridge University Press.